Stock status is current as of 4/22/2019 4:45 AMET. For a fast, responsive PC experience the Intel Core i3-7100 Processor is the perfect. This processor with LGA1151 Interface guarantees stable connection between the processor and the motherboard. The processor speed of 3GHz helps you to meet your needs with great efficiency. The Smart Cache 6 MB allows high performance computing for demanding applications. Intel Turbo Boost technology which accelerates processor clock speed up to 20%, speeding up the workflow, and accomplishing more in less time. Whether you use your PC for gaming, rendering, editing or creating, this Intel� Core� desktop processor delivers a great PC experience. Amazing digital media experience with up to 37% faster conversion of video for web upload, up to 15% faster photo editing and up to 17% faster conversion of CD music tracks to MP3. 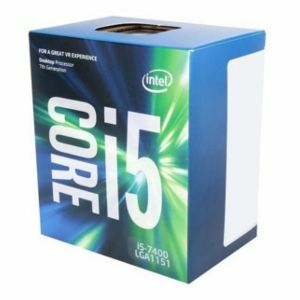 Order the Intel Core i5 7400 now!